We assembled a set of currently-available Pinot Noirs, keeping in mind to include modestly-priced bottles as well as a few higher-ticket wines. 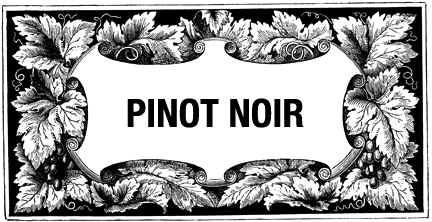 As is often the case with Pinot Noir wines, there was quite a range of rankings. All but our first place wine received at least one last place vote and 7 of the eight wines received a first place tally. Two wines were ahead of the pack, with three wines essentially being tied for third place. Our seventh and eight place wines were well behind the group and while they were technically sound wines, they lacked varietal character. Having been blended with 24% Mondeuse, according to the label, this wine was nicely vinified, but it lacks varietal character. The color is typical of Pinot Noir and the nose shows some dark cherry fruit notes in the direction of Pinot Noir. Dry and medium-bodied, there's a hint of cherry fruit on the palate. It's merely a simple, standard 'red wine.' No stars on my three star scale. Clear in appearance and light garnet in color, the nose of this wine is muted and merely "vinous." The wine is dry and medium-light bodied. There's virtually no Pinot Noir character and the mild tannins reduce this wine to mere "red table wine" status. If you've not heard of this wine, one might assert "Ignorance is Bliss." At least it's "only" fifteen dollars down the drain, not fifty. Garnet in color, this with has a hint of cherryish Pinot Noir fruit on the nose. The wine is dry on the palate and has a nice level of acidity and faint tannins. It's medium-light bodied with a nice hint of cherryish Pinot Noir flavor. There's a touch of oak, as well. It's ready to drink now and will probably retain its level of interest for another two or three years. One star. Clear in appearance, this wine is medium garnet in color. It starts with a wonderful fragrance, deep in Pinot Noir and nicely oaked. This showed the best nose to start the tasting. It's dry and nicely acidic. Medium-bodied. The wine is quite good on the palate, too, confirming the same aromas and woodsy elements. It's a fairly complex wine and with light tannins, making it drinkable immediately. I found it to be edged out at the finish line by my first place choice. One-and-a-half stars+. A previous vintage of Sanford's S&B vineyard wine had done very well in a previous tasting, so well splurged for a bottle of this latest incarnation. The wine is deeper in color than most Pinot Noir wines, showing a dark ruby tone. There are some cherry aromas, but I didn't find it to be especially varietal or Burgundian in style. Perhaps this will develop with additional bottle aging? Presently, though, it's more of a powerhouse red, being robust and mildly tannic. Its varietal identity is a bit confusing. One star, perhaps. Clear appearance and showing medium-dark garnet color, this wine offers hints of spice notes and a mildly earthy character on the nose. It's dry and medium-bodied. I faulted it for its lack of varietal character. No stars from me, but three tasters had this highly ranked. Bright garnet in color and brilliant in appearance, the regular bottling of Taz Pinot Noir displays smoky, woodsy fragrances and a creamy vanillin aspect to its nose. The wine is dry and mildly acidic. Medium-bodied, there's a nice oak spice to match the bright cherry Pinot Noir fruit. It's delicious now and should be fine for three to five more years. One star+. Clear in appearance, this wine is of medium garnet color. There's lovely Pinot Noir, Burgundian-styled perfumes from this wine and even a hint of a truffle-like character. It blossomed handsomely over the course of the tasting. Dry and moderately acidic, the wine shows good oak and plenty of Pinot Noir fruit on the palate. Mildly vanillin and with might tannins, this is a very stylish and beautifully-made wine. Two stars.